The chapel that once stood at the heart of the Middlesex Hospital on Mortimer Street is to open to the public this month after undergoing a £2million restoration. Middlesex Hospital Chapel will be on public view for Open House weekend. Completed in 1929 for the benefit of patients, staff and visitors of the Middlesex Hospital, and closed since 2005 when the hospital was vacated, it has stood shuttered and alone on the site while everything else around it was demolished. Now the Grade II* listed Middlesex Hospital Chapel is to open for the Open House Weekend of 19 and 20 September. 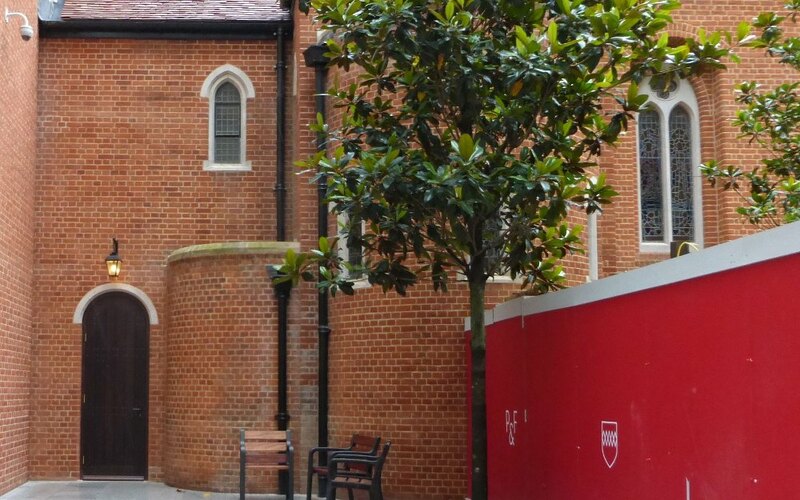 The Chapel will also be transferred into the hands of a charitable trust which will be charged with looking after the building and maintaining it with a £300,000 dowry provided by a s106 agreement as part of the Fitzroy Place commercial and residential development being built by Exemplar. 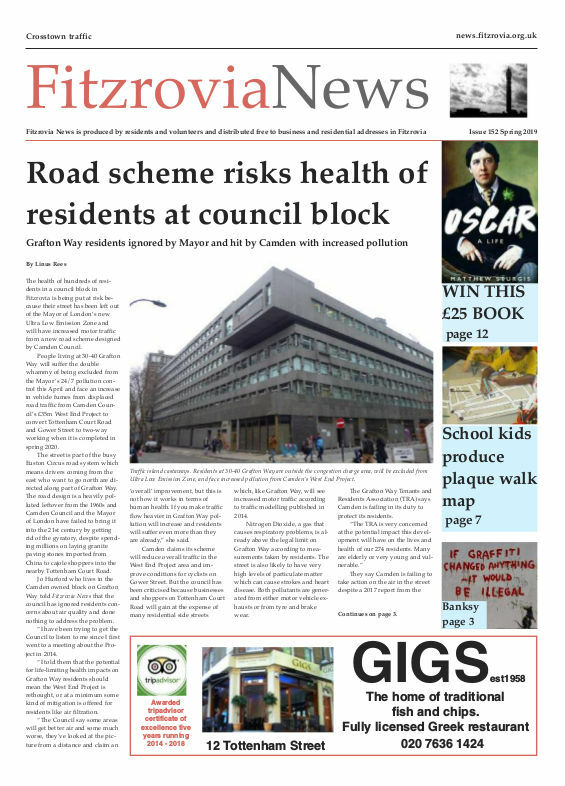 The trustees, who are mostly local residents, are referring to the building as The Fitzrovia Chapel, despite a campaign by Fitzrovia News and a petition from over 3,000 people asking for the name Middlesex Hospital Chapel to be preserved. Edward Turner, chairman of The Fitzrovia Chapel Foundation, told Fitzrovia News about their plans for the building which is intended to be for public benefit. “When we conclude our negotiations with Exemplar and Westminster Council and the lease is handed over (hopefully before the end of the year) the chapel will be open for quiet contemplation and enjoyment by local residents and workers whenever possible,” he says. The trustees expect to start by testing with shorter opening hours, then gradually increase times depending on demand, security and resources. Fitzroy Place has 24-hour security which provides some assurance but if they feel that access needs to be supervised the trustees are hoping to recruit a core group of volunteers to invigilate. Turner says they will be applying to Westminster Council for a number of licences such as for the performance of plays, and live music, as well as to serve alcohol. They are also in discussions with the City Council about holding weddings at the chapel, although licences for civil marriages are usually only granted to buildings with no religious symbols. Although the Chapel was never consecrated and will be secular, it is historically Christian with evident and important imagery. They are optimistic that Westminster will relax restrictions and permit civil marriage ceremonies. Turner says that former staff of the Middlesex Hospital would be welcome as participants. “We have accumulated a lot of historic records on the Chapel and will have a specific project to ensure their correct interpretation and accessible presentation,” he says. The full list of trustees: Edward Turner (chairman), chartered accountant and chairman of the Fitzrovia Community Centre; Wendy Shillam, architect and town planner, and chair of the Fitzrovia West Neighbourhood Forum; Carolyn Keen, former Lord Mayor of Westminster; Dan Bates, oboist and actor; Georges Sokol, pianist and composer; Kim Southgate (will be appointed a trustee when lease negotiations are complete), estates director of Fitzroy Place. Middlesex Hospital Chapel, 2 Pearson Square, Fitzrovia, London, will be open from 10am to 5pm on Saturday 19 and Sunday 20 September as part of Open House London 2015. Other venues in and around Fitzrovia taking part in Open House London 2015.